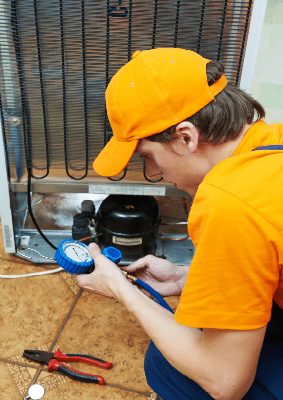 A fridge freezer that is not working properly can be very costly, especially if you end up losing everything in the freezer because it is no longer being maintained at the proper temperature. We are known for our home service calls because we provide the best fridge freezer repair service at competitive prices. we offer a fixed fee one off labour charge of £119.00 plus any spare parts. No labour charges on return visits to fit parts. Fridge freezer repairs which are not made in a timely manner can be a major source of loss. Fridge freezers can also be a costly appliance to replace, so contact us immediately to solve your Fridge freezer problems before they get out of hand. If you would like us to inspect or repair your Fridge or Freezer, call us today at 020 8464 0047 to schedule a visit by one of our technicians.